Low-cost mobile devices, cloud computing and open-source software continue to reshape the Technology, Media and Telecommunication (TMT) sectors of the global economy. The impact from the transformation is far reaching, as growth stalls in some of the more traditional product and service categories. 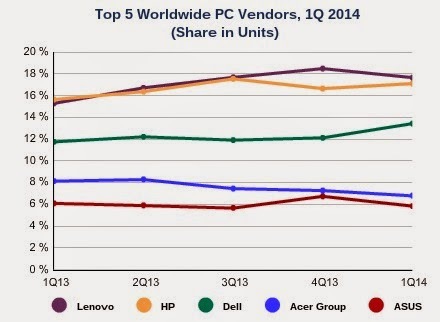 A case in point; worldwide personal computer (PC) shipments totaled 73.4 million units in the first quarter of 2014 (1Q14) -- that's a decline of -4.4 percent year-on-year, according to the latest market study by International Data Corporation (IDC). Although still in a downward spiral -- and with continuing weakness in consumer and emerging market segments -- the preliminary results are actually slightly better than a projected decline of -5.3 percent. Similar to the latter part of 2013, the upside in the first quarter arose primarily from demand in mature commercial markets. Commercial refresh projects, which had already been protracted, received a last push from the impending end of Windows XP support, particularly in Japan. In addition, the slowing demand for media tablets seems to have helped constrain previously drastic cutbacks in notebook PCs. Nevertheless, emerging regions continued to post weak results, with growth in Latin America and Asia-Pacific (excluding Japan) falling even faster than recent declines as both economic conditions and continued tablet penetration stifled PC shipments. "Worldwide PC shipments have now declined for eight consecutive quarters as a result of shifting technology usage and competition (notably with tablets and smartphones) as well as economic pressures related to the Great Recession, sovereign debt crises, and their related impact on international trade," said Loren Loverde, vice president at IDC. According to the IDC assessment, the global economic front seems to be gradually stabilizing or improving. However, this has been a slow process, and it is unlikely that sovereign debt issues will be resolved soon or that growth in emerging markets like China will return to prior levels. On the technology front, the transition to more mobile devices and cloud-based usage modes is unlikely to slow down, although the short term impact on PC shipments may be reduced as tablet penetration rises -- which is happening in some mature regions of the world. In summary, the net result remains consistent with IDC's past forecasts -- in particular, that there is some potential for PC shipments to stabilize, but not much opportunity for meaningful growth. PC shipment growth in the United States remained slightly faster than most other regions in the first quarter. However, the passing boost from XP replacements, constrained consumer demand, and no clear driver of a market rebound are expected to keep growth below zero going forward. A rebound in consumer or a continuation of accelerated commercial upgrades could boost growth slightly, but low demand for upgrades in general -- combined with competition from tablets and lower-cost 2-in-1 systems -- limit the growth potential. The American market continued to stabilize with growth near zero -- in line with forecasts. With shipments totaling 14.3 million PCs in 1Q14, the U.S. market contracted by -0.6 percent from the same quarter a year ago. Desktop shipments were slightly stronger, posting 3.5 percent growth, while portables remained in negative territory.